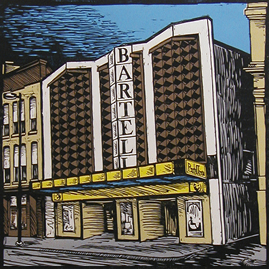 The Bartell Theatre website is almost a year old! And the below information has stayed mostly the same. There is a continued effort to bring more information to the website so if you don’t see what you’re looking for, let us know and we’ll put it on the list to include. Details on the navigation and elements can be found below. The navigation menu is on top of every page. This will provide the basic navigation throughout the Bartell Theatre website. It will always stay on top of the page so that at any point, you can access the basic navigation. The Bartell logo in the center of the navigation menu is a “home” button. Clicking this will navigate to the homepage. There will be a footer on every page and contains basic information on the location and contact for the Bartell Theatre. It will also have the hours for which the Ticket Office is open. There are logos for the Participating Theatre Companies (PTC) that also double as a link to the corresponding PTC website. The homepage has a header which has a current message along with the basic location and contact information for the Bartell Theatre. All productions/events that have yet to be closed will be represented with either their poster or an excerpt. By clicking on the poster, you will be redirected to additional information on that production. Below each poster or excerpt is a button that can function as a ticket/donate button. These four pages will be similar in function. They will be pages with sections that will go into detail for their respected information. For wider screens, you will also see a menu that will jump to the corresponding section for easier navigation. The information page contains the search bar and various detailed content that cannot be reasonably described in the About/Rent/Donate/Volunteer pages.